"KIZUNA" (WINDS) was jointly developed by JAXA and National Institute of Information and Communications Technology (NICT), and launched by H-IIA Launch Vehicle on February 23, 2008. 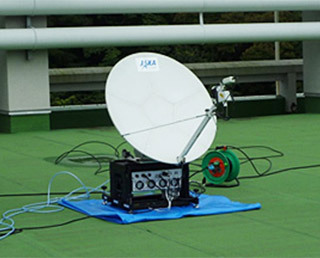 "KIZUNA" (WINDS) connects to the network between space and the ground, and demonstrates the technologies related to ultra-high-speed and large-volume data communications. KIZUNA satellite communication system uses the latest technology to create a faster, more efficient and more convenient communications environment. KIZUNA will lead to ultra-high speed international Internet-based communications. The technology takes advantage of the fact that satellite communications are far-reaching, multicasting, and disaster-resistant. It will enable high-speed, large-volume data transmission, allowing ultra-fast domestic and international Internet-based communications, in particular between Japan and its neighboring countries in the Asia-Pacific region. Ultra-fast satellite-based Internet-based communications will remove the so-called digital divide by providing high-speed Internet service in areas where the terrestrial communications infrastructure is poor. Among other uses, this will make possible great advances in telemedicine, which will bring high-quality medical treatment to remote areas, and in distance education, connecting students and teachers separated by great distances.